Mac ran about the kitchen, picking up crumbs and bits of cheese. He never had much time to sit down and enjoy his food. Tom, the cat, always disturbed him in the middle of his meal. One evening as Mac nibbled on a piece of cheddar cheese, Tom snuck up on him and stepped on his long tail. Mac pulled and tugged until it got loose and ran out of the kitchen and into the library. Mac had never been in the library before. "Look at all the books." 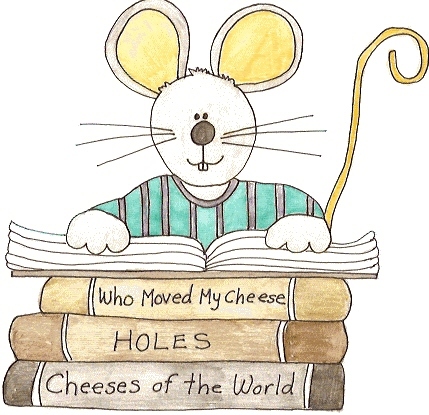 Mac forgot about the cheese and pulled four books down off the shelf. "Maybe one of these books will help me learn how to outsmart that cat." He sat on the floor and held one of the books in his tiny hands. All night long he read until his eyes hurt. Before he knew it, the sun was up. He felt so tired that he went back to his mousehole and fell asleep. After he woke up, Mac ran back to the library and read some more. Soon his tummy rumbled. "I'm hungry. I wonder if Tom is in the kitchen." He put the book down and tiptoed, peeking around the corner. Tom lay sleeping in front of Mac's mouse hole. "I'll sneak a piece of cheese and if I am very quiet, maybe a cracker too before Tom wakes up." He ran to a piece of Swiss cheese and nibbled on one of the corners. He was about to take a big bite when he heard a soft purring sound behind him. "Gulp!" Slowly he turned around and saw Tom smiling at him, his sharp teeth showing. Mac ran between Tom's legs into the mousehole. Tom chased him and sat down in front of the hole, guarding it day and night. Mac couldn't go to the library. Instead of worrying about Tom, Mac thought about all the things he'd learned from reading the books. He might not know how to outsmart a cat, but he knew a lot more about everything else.